Monschau is a scenic ton by the German Eifel that I happened to stop by and I would recommend it to my fellow travelers as well. The town was built 300 years back and it is surrounded by green hills all around. Being a scenic destination with a small town charm, it acts as a romantic getaway for many. I also discovered that it is considered as a cultural hub of the region and there are different events that are held here. This is also known as the Red House, made of the timbered architecture that characterizes many buildings in this town. This particular building of a cloth manufacturer was built in 1760 and it is now a building to showcase the luxurious furnishings of Louis XVI, Rococo and of the Empire era. This is another local attraction which I stopped by. It is interesting to note that this castle, which was built in the 13th century, houses a youth hostel as well. This is another feature of this town. 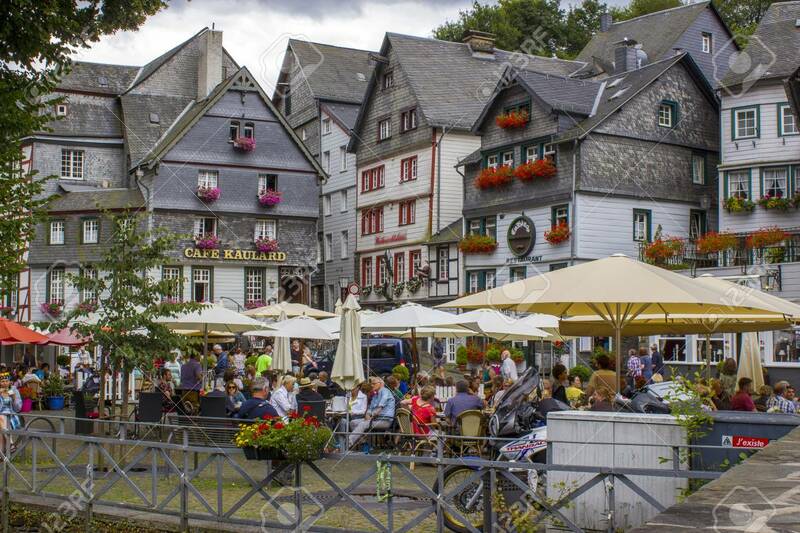 If you are visiting, make sure you come by in summer when the Monschau Klassik music festival is held, in the open courtyard of the castle. This is another unique local attraction here. It was easy for us to get directions and come by this historical mill. This mill is now run on electric power but in olden times it used to work with a wheel run by water. The mill churns out about 19 different types of Monschau mustard. We also visited the Glass Works that offers a demonstration of the old craft of blowing out different craftworks of glass; if you have time stop by the museum called Weiss Printers as well as the Felsenkeller Brewery. Milan, the city hat every fashion enthusiast dream to visit. This is a behemoth city has lot more to offer than just the designer shops. It is a sublime mixture of old and modern culture. Other than checking out the sites, My friend Kathy with ecotouchclean.com and I loved bustling in the atmosphere of the city. There are a plethora of things that you can do and see in the city. Let’s take a look at few of them. It is a monumental structure which is famous for its extraordinary architecture. Believe it or not, it took 600 years to complete this cathedral. It had been established in 1386 but was only completed in 1965. The cathedral has a gothic-like architecture. I found the front façade to be excellent. The interior portion is highly decorated and the stained glass windows give an exceptional look to the interior décor. My trip to the city would have been incomplete without visiting this cathedral. When you walk into the grand gallery, it might give you the feeling that you are standing inside a hall of opera palace or house. It doesn’t at all appear like the shopping mall. However, this is actually what it is. The extravagant and opulent indoor shopping area is unique. I have never come across anything like this. It had been developed in 1877. You will find top-class designer shops in here. This castle is centrally located in Milan. It is placed between gardens and grounds. Even though it has been constructed in 1370, the structure still retains its power and elegance. At the front of the castle, you are going to find the large brick walls which are lined by the central guard tower and the battlements. Other than the castle, I also came across some small museums which showcase different artifacts along with the historical facts of the castle. Spread over an area of 390 km2, a city in its primary form at the West coast of Kyushu, which happens to have a castle that has complete castle structure and is still kept the pretty compact in its preservation. This city has a population of about 6,50,000 people and provides its visitors and travelers opportunities such as visiting the Kumamoto Castle, the gardens, Hosokawa residence which was earlier the place of residence for one of the high ranked samurais. Also, the volcano Aso can be checked out for a change. The museum of art: Ashikita, the intriguing Waku Waku undersea aquarium. The place called Tawarayama which lies in the Minami Ask area tend it one of the famous spots due to the hiking facility it provides. Shimotori shopping arcade, Kamitori shopping arcade, Kihari Fudoson temple, Tamazaki Bairin, Kato, Namaikizakari Street, Oaks Dori, and Kaminoura Dori are some of the other tourist spots. The food items that must be given a try are the red Wagyu Donburi, Kumamoto Ramen which is complete with its aroma of roasted garlic, Tapiien, Dago-Jiru, Renkon & Hitmoji Guruguru and even sweets like Ikinara Dangi, the hereditary stick rice sugar and syrup candy and the famous booze of the place which is made from the Japanese rice. When around this place, it is a must to check out Hugo Koryu the site traditionally meant for the tea ceremonies which hold a lot of importance in part of the Japanese people’s life. The accommodation facilities include Mitsui Garden Hotel, Hotel Nikko, New Otani hotels, Wasuki Tsukasakan, GR Hotel, and Dormy Inn, etc. The transportation unit has two city tram systems which go in the east and the West direct and cover the spots you would want to visit like Kumamoto station, a castle of Kumamoto, the arcade area and the Jojuen garden. The rates are constant throughout the city, and the travels are supported by one day pass or even IC cards from other parts of Japan. Nagasaki is the capital city of Nagasaki Prefecture on the island of Kyushu, Japan. Nagasaki has a vast history of a nuclear explosion during World War II. Its history bought us goosebumps, but their hard work and the way they progressed after that, is an inspiration. It is built on a natural harbor with buildings on the traces if hills, which gives breathtaking views all around. I have learned a lot from Nagasaki and its surroundings. The people, their culture and their positive attitude towards life are worth learning. It is also known as Gunkanjima after the nuclear attack was destroyed. The parts of it bring, and Hiroshima Island brings a shiver down my spinal cord, it is an abandoned island. Nobody can understand the pain those people had gone through, but the experience on that island was enough to know the conditions. According to us, it has the prettiest view of the whole city or Nagasaki, with parks and playground, which gave me immense peace and cleansed my aura with its positive environment. And it can be accessed by cable car or bus. Glover Garden is a park in Nagasaki built for Thomas Blake Glover, who was a Scottish merchant and contributed to the modernization of the city. The garden was planned and designed beautifully that it made me want to live and spend the rest of my life there. This museum took me down to the days of World War II. It is a theme museum based on the atomic bombing by the USA in 1945. It contains pictures, artifacts, clippings, and remains of a nuclear attack. It gave me the scary experience of the nightmare which those people lived in those days. Any history and modern architecture lover can get lost in the vast and deep history of this small and little yet amazingly beautiful place. And the spring season is the best time to visit this lovely place.